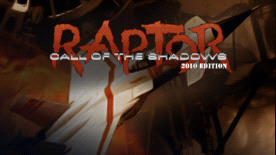 Raptor: Call of The Shadows is a 2D vertical shoot ’em up originally released on MS-DOS in 1994. Fight as a mercenary in a futuristic world and try your best to defeat the MegaCorps competitors. Use your super-tech Raptor, considered as the future’s most awesome warplane, and face hordes of relentless enemies on ground, air and sea through a total of 27 missions! Over missions you will earn credits, you will discover bonus or secrets, which will allow you to buy new weapons, shields and bombs to improve your ship. • A considerable arsenal of weapons and explosives! Raptor is the most action-crazed, guns blazing, shoot ‘em up game you’ve ever played!